The buy-in for Liberty Slots Casino's the weekly Blackjack Classic Tournament is still just $5 but the casino has increased the prize pool to $750. For the next tournament, which begins Monday, September 15 and ends the following Sunday, the game is Atlantic City Blackjack. Blackjack has been popular at the casino over the summer, but so has video poker. Bump It Up Joker Poker has been one of the casino’s most popular video poker games. You can play one to four hands per game and you advance to the next hand when you're dealt a winner. 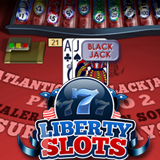 Liberty Slots’ is known all over the world for its slots tournaments. Their $30,000 Autumn Jackpot slots tournament is now in progress and you have until September 30th to achieve the highest score on the ever-popular Funky Chicken slots game. You'll find more than a hundred slot games from Wager Gaming Technology at Liberty Slots which offers new players up to $777 in welcome bonuses.